Make in India right now is just a slogan. The policy content is missing or not clearly articulated. 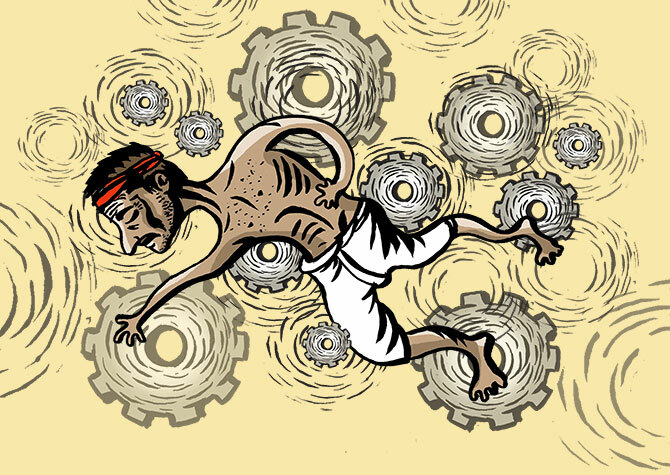 The lion with cogs and wheels must now show some majestic movement forward, says Rahul Khullar. 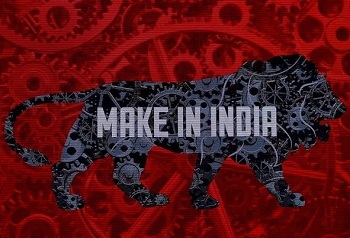 Make in India (MII) is, at once, a slogan, a symbol of aspiration (a modern manufacturing country), and a guarantee of quality (a Swiss chronometer?). The MII initiative was launched in September 2014 to promote manufacturing and create jobs in India. More than two years later, where are we? First off, MII is not new, neither in name nor in content. In 2009, a major export promotion drive initially called Made in India evolved into the successful India Show. MII's ultimate goal is to increase manufacturing and employment. 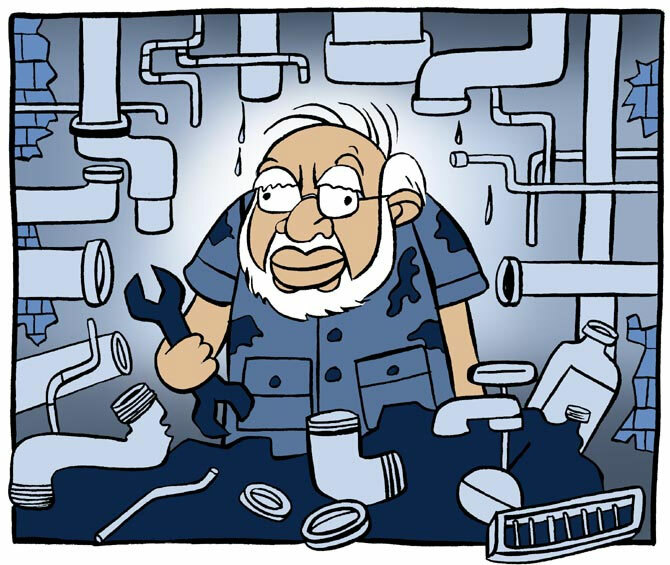 No different from the now dormant National Manufacturing Policy (NMP), 2011, which sought to increase the share of manufacturing in GDP and create 100 million jobs. MII's operational focus was on improving the Ease of Doing Business (EDB). Why? It would promote investment which, with a lag, would boost growth and employment. State governments were made "partners" by plugging them into MII via the EDB goal. Two years, on the World Bank ranking on EDB shows no significant improvement for India. To most, except those in government, this did not come as a surprise. Ask yourself, over the last two years how many domestic industry leaders made a statement (much less lauded) that EDB had perceptibly improved? None. Even today industry's lament is about EDB, for instance, the IT industry told the finance minister so very recently. So, judged by its own immediate objective MII has not been a roaring success. Make in India or breaking India? For the share of manufacturing (industry) in GDP to increase, the rate of growth of manufacturing has to be higher than that of the tertiary sector. And, this has to be maintained for some time. This has not been witnessed in any quarter since 2014. Industrial growth has not brought much cheer, fluctuating on a monthly basis, sometimes even turning negative; but, always consistently low. Exports, a potentially major source of manufacturing growth, have declined continuously for two years. Growth in industrial credit has been lacklustre (sometimes negative). This is across all units, small, medium and large. Capital formation -- the basis for future growth -- remains sluggish; the Reserve Bank of India estimate of excess capacity is 30 per cent. Growth in manufacturing employment (inclusive of SMEs) has been far below expectations. In short MII's major goals have not been met; worse yet, future prospects of their being met are not bright. To be fair, the government has been in an unenviable position. The domestic situation is fraught: private consumption is growing slowly, investment demand is anaemic, industrial revival is shaky, agriculture is in serious distress, and the banks' non-performing assets s are a major drag. Demonetisation has inflicted another setback. Protectionism is on the rise. Risks to the global economy and growth are high. India cannot export its way out of trouble. It has to focus on the domestic economy, making action on MII all the more important. First, policy statements are not sufficient (and MII is not even that). They have to be translated into operational plans -- in government parlance, sub-strategies, schemes and programmes. Without this, the policy statement has no traction. This is why the NMP 2011 foundered. Sadly, MII seems to be going the same way. The government must move beyond meta-statements of intent. Second, industrial policy in a federal polity is completely different from that in a unitary structure. The central government has issued numerous Industrial Policy Statements from time to time. Most have been noble objective-oriented political announcements of intent coloured by the politics of the day. Of their own, they were largely ineffectual. During the licensing raj, the central government used its clout to determine one aspect, location. The central government did well in promoting balanced regional development. There was little beyond that. Actual industrial "policy" was driven by the states; and, with good reason. Crucial matters impinging on industrial units are primarily state government subjects: land, water, electricity, labour laws, sales tax/value added tax etc. Moreover, states have done much better in fashioning and implementing industrial policy. Consider the following. Bangalore was still the sleepy garden city in 1990; in a decade and a half not only has it become Bengaluru but also the heart of the IT and biotech industry. In 1990 Gujarat was short of power and industry. Today it is surplus in power (with one ultra mega power project), has two gigantic refineries, India's largest port, and a major pharma cluster. Gurgaon was a nondescript town in 1990; in two decades it became home to an auto industry (with ancillaries), a base for IT majors with a bustling BPO industry, and much more. Take Tamil Nadu: a major auto export industry, special economic zones (SEZs) dotting the state and a base for many exclusively East Asian manufacturers, all in the space of a decade. Andhra Pradesh: a similar success story, be it Cyberabad or the Sri City SEZ (now a poster boy for MII). The main reason states succeeded was that they fleshed out their industrial policy, provided incentives, and actively canvassed foreign and domestic investment. Political leadership of the chief ministers ensured effective policy implementation. Will you buy a Made-in-India product? For all the hoopla, there is precious little to show for the MII initiative. Prospects for future manufacturing growth are not rosy. Clearly, the MII mission is in jeopardy. First, MII right now is just a slogan. The policy content is missing or not clearly articulated. That must be worked out. Second, limiting the states' involvement solely to EDB was not wise. The Centre and the states had to work together to decide what the Centre needed to do and what was required of the states. Third, translating MII into operational details devolves on several ministries. For instance, company affairs, skill development and labour. It seems they have yet to come together to coordinate and design schemes and programmes that would translate policy into actionable components, both at the central and state levels. As it stands, MII may not take off. Even now it is not too late: Put flesh on the MII skeleton. The lion with cogs and wheels must now show some majestic movement forward. Rahul Khullar retired as chairman, TRAI, and was commerce secretary, 2009 to 2012. BJP union leader: How will Make in India help our country? Is your 'Made in India' smartphone in danger?